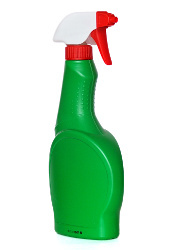 How can I make sure a spray bottle is really clean before reusing it? | How can I recycle this? First I want to comment that this is a fantastic website! Everyone in the world should be accessing it. I’m recycling plastic spray bottles to put pure, herbal cleaning products in. Is there a way to make sure these bottles are clean and free of chemical residue before I reuse them? A way to sanitize them first? If I was going to use it for another cleaning product, I probably wouldn’t go overboard with cleaning it, just a washout with water or something, (unless the original product was very bleachy or something that would react with my new product) — I personally wouldn’t mind the chemical residue dregs for that first refill. If I was reusing the spray bottle for something else (eg, as a water spray for plants) though, then I’d probably wash it out more thoroughly (a few rinses of hot water) – but still probably not to a level that I’d class as “sanitizing” it so I don’t know what is needed to do that. Any other suggestions? How much effort do you make to clean out cleaning product bottles before reusing them? I just put mine in the dishwasher after I rinse it out a couple times with hot water but really, for most things, hot water is more then sufficient. After cleaning it any way, use small cup of any vinegar, you will like the result. Vinegar rulez! It removes any residues and smells! 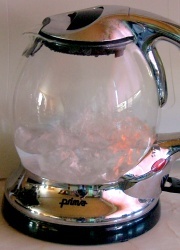 I wouldn’t use hot water for plastics! And definitely would not put any plastic in the dishwasher! Clear vinegars, like apple cider vinegar or white distilled, are always good for making an acidic solution, to naturally and gently clean something. I actually use a tablespoon in a bottle of tap water, as a “deep cleanser” in the shower, if I feel a yeast infection coming along. The truth is, everyone is right. But not on the same page. Nancy is trying to put non-chemical herbal stuff in recycled bottles. It does matter the type of bottle. Plastic and glass can hold on to the same substance in different ways. The only way Nancy would be able to feel safe at night: If she boiled the glass bottles. That is the only way to sterilize-sterilize anything, cleaning it to the perfection she desires. The reality, Nancy is probably using plastic. Like most of us. Because its cheap and it’s overflowing in recycling cans. Nancy can’t boil the plastic. Nancy: DON’T Boil the plastic bottle. Add a little bit of vinegar (or a lot) to the bottle, with hot water, and shake. A lot. You can and should put it in the dishwasher, stable and upside down. But, only if she is sure the plastic is thick enough (as thick as solid tupperware) and before you run the washer, turn OFF the “Heated Dry” function, so you are only using the dish washer to sanitize with the detergent and hot water, and not melting or warping it. What Nancy needs to worry about is the nozzle of the spray bottle. Even after removal, it holds a few sprays of the old toxic stuff she is avoiding. I wouldn’t put this in the dishwasher, because if the heat warps it, you’re project is already over. You can dunk the nozzle into a bowl or sink of warm to hot water, and start pumping. You have to continually pump the new clean water, or the vinegar cleansing water, out of the pump. It’s the only thing that can clean inside of the nozzle. I have once used just vinegar in a glass and stuck the straw into, and started spraying the vinegar through the pump into the sink. But to answer your question, Nancy, the only way to truly know if you have cleaned it, is to put it back together again: Smell something, and then spray it. Smell it again. If it smells like water, then YAY! Congratulations! If you want the bottle to actually taste pure, I would pump the nozzle with hot water, spraying into the sink as many times until your arms hurt, and you realize that you regret starting this project at all.